The life of the Sacred Alchemist is a Mystical Path, a Grand Adventure as mastery is gained and the highest potential attained. Life becomes so much more glorious than ever imagined when the Art of Sacred Alchemy is incorporated and all adverse conditions are transformed. It is a Sacred Journey where a High Destiny is won and where every dark night gives way to a glorious new potential. 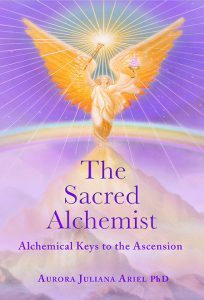 In this book, masterful Alchemical Keys are given that allow life to be lived so richly and where great fulfillment is realized. An abundant life, where the bountiful gifts of Spirit weave their magic into our Sacred Destiny and purpose for being here. Everything makes sense as the deepest aspects of our Divine Nature is unveiled. Like a treasure hunt in the deep jungles of the human psyche, jewels beyond price are retrieved as the human self is transformed. It is then we can partake of the majesty and grace of a Benevolent Kingdom, seeing with new eyes and living in our truth, the blessing of which is a never ending treasure trove of sacred experiences. As we enter the new reality, everything changes and the world around us transforms. The future becomes brighter and all challenges resolve. This is a hero’s journey to the most sacred part of the Self, a trek ancient ones walked before us to attain the Illumination that enlightened the world. This is a path unique to each one, a sacred tryst with our Illumined Self to bring our most Sacred Offerings to an awakening world, unveiling the Inner Truth that is the greatest treasure of all.